Participant Media‘s Captive State has added a new cast member. 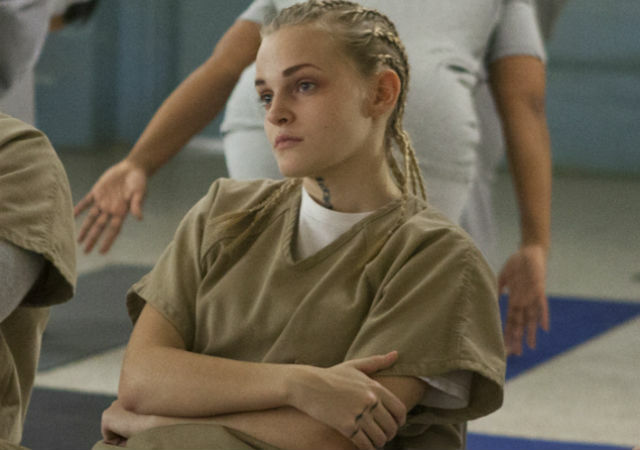 Madeline Brewer (Orange is the New Black) is attached to co-star in the post-alien invasion film, which will be directed by Rupert Wyatt (Rise of the Planet of the Apes), according to Deadline. Brewer will join John Goodman (Monsters, Inc.), Vera Farmiga (Bates Motel), Kevin Dunn (Veep), Ashton Sanders (Straight Outta Compton), Jonathan Majors (When We Rise) and Colson Baker, a.k.a. Machine Gun Kelly (Beyond the Lights) in the film as Rula, Sander’s love interest. Captive State is set in a Chicago neighborhood almost a decade after an extra-terrestrial invasion of planet Earth. The film will show what life is like, “for both sides of the conflict – the collaborators and dissidents,” something that sounds reminiscent of District 9. The screenplay comes to us from Wyatt and his wife Erica Beeney (The Battle of Shaker Heights). Captive State is set to begin filming in late February. In Orange is the New Black, Brewer played Tricia Miller, a young inmate addicted to drugs who, though she shoplifted, kept tabs on what she owed so she could pay the stores back. Brewer is also known for her roles in Hemlock Grove, The Deleted, Grimm and Black Mirror. She will next be seen as Janine in the upcoming Hulu series The Handmaid’s Tale along with Elizabeth Moss (Mad Men), which premieres on April 23, 2017. She’ll also appear in Mark Webber’s film Flesh and Blood, which premieres at SXSW in March. This will be Brewer’s studio film debut. Are you guys excited to see Captive State? What is your favorite post-alien invasion film? Let us know in the comments or tweet us @ComingSoonnet!